Nicolas Cage. Ex-con, face switcher, voodoo ghost fire guy, "historian," future Expendable, angry driver, owner of a Nickle Lamp, and all-around crazybones is set to star in I Am Wrath. A film in which a normal man (which we all know Cage isn't) turns into an out of the ordinary vigilante, hopefully Batman style, after he finds out that police corruption led to the murder of his wife. Cage will then proceed to "destroy those who abuse their power." Think about this for a minute. 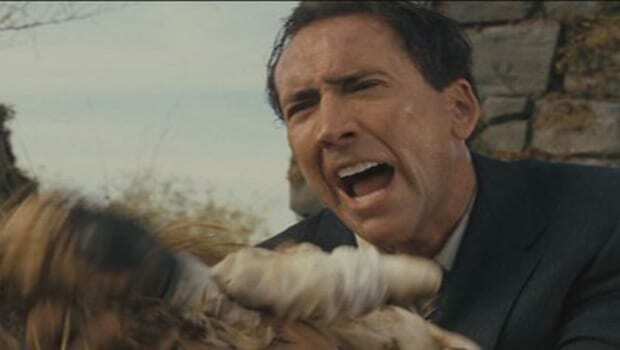 Like his character in Stolen, Nicolas Cage is going to be running around like a madman murdering the living poopballs out of people. It's like his whole life was leading up to this and Alex's Nickle Lamp (seriously, just get on it already). Just take all of my damn money. I didn't need it anyway. Oh yeah, The Exorcist's William Friedkin could direct this. Hollywood, you make the best decisions sometimes.